Posted in desserts, French, Italian, recipe by Antonio Tahhan on August 25th, 2008. You can follow any responses to this entry through the RSS 2.0 feed. You can leave a response, or trackback from your own site. 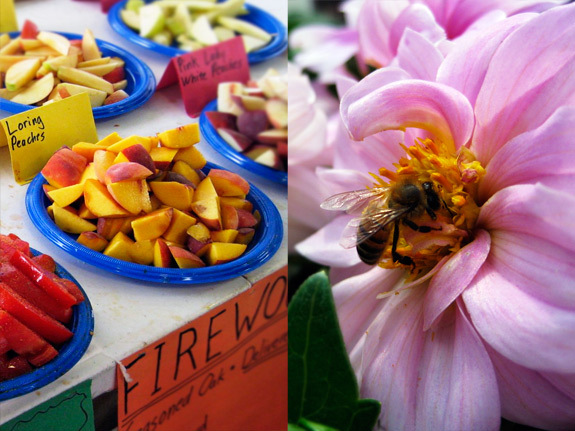 Thanks for visiting us at the virtual Beekman. We really enjoyed looking around your blog. You do a wonderful job with it. Ahh, I love the Eastern Market. I was just there a few weeks ago and wanted to snap some pics but got a little claustrophobic. Suppose going on a Saturday afternoon will do that to ya. Great photos & recipe! I love crotadas, Italy with all it’s sweets and you for being a good sport. I might have been really p’d off at the supervisor but like you would have found solace at the Farmer’s Market and something sweet. We should get together LOL! Then you can make me several of these gorgeous looking crostadas! Those flowers are gorgeous as is the galette. I’m sorry to hear about the airport dude, and I’m surprised they did pretty much nothing for you. What a bunch of losers. But, I’m glad you don’t let that stuff get you down, and hey, we all get to enjoy your galettes now 🙂 Those peaches look amazing, and you’re sooo right about ‘hand held goodness’. You had three? Haha, rough day. The gym works wonders for rough days too… I’m glad you took advantage. If a couple more planes cancel in your future, you’ll look like Arnold. Ooooh! You know how I just love little servings and these galettes are it!! I’m so sorry about the airline mishaps. They are quite good at screwing people over. Glad you were able to make the most of it. These little beauties look delicious! This is my idea of a near-perfect dessert . . . the only thing missing is a cup of French Roast steaming next to it! 🙂 Nice work; thanks for sharing the recipe! these look amazing! i don’t know anything about growing peaches but i am guessing that cracking open the pits might be step one. 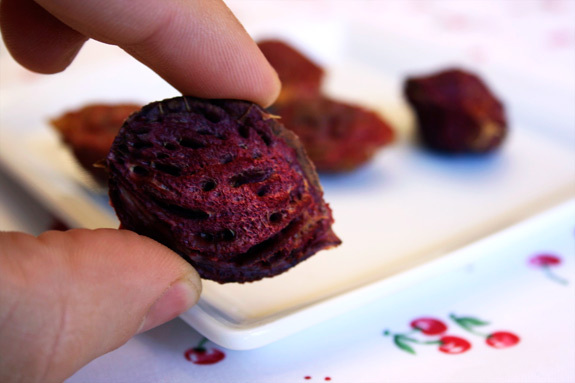 as far as growing your own tree from the pits,chances are the peaches you used were a hybrid of some sort and second generation fruits or vegetables tend to be of lesser quality than those of their parent plant. plus it would take a few years to get a tree big enough to yield fruits. Bummer about the flight, but, Tony, those galettes are incredible. It looks like the sun contained in pastry! I love the size of these pies and the beautiful way you arranged the slices inside. I second what Chuck said. You don’t know if the peaches you had were hybrids or not and the seeds might not be worth growing and it does take a lot of time. Great pictures, and nice lookin’ blog! see it wasn’t so bad missing the flight afterall ! u get to go to the farmers market n we get to see a lovely peach galette. BTW my friend’s( whom i told u abt) name is also jess/jas (short ofcourse) … what a co-incidence rite ?? Oh I love Eastern Market, and wish it were closer. I could seriously spend every weekend there. 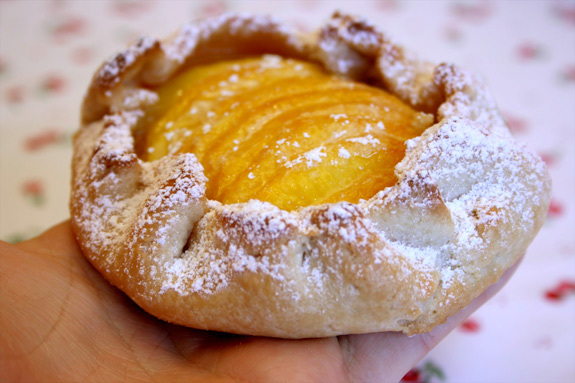 Your peach tarts are beautiful. Also, I have some instructions (somewhere) for growing peach trees. I’ll dig them up and send you a copy. What a lovely post. 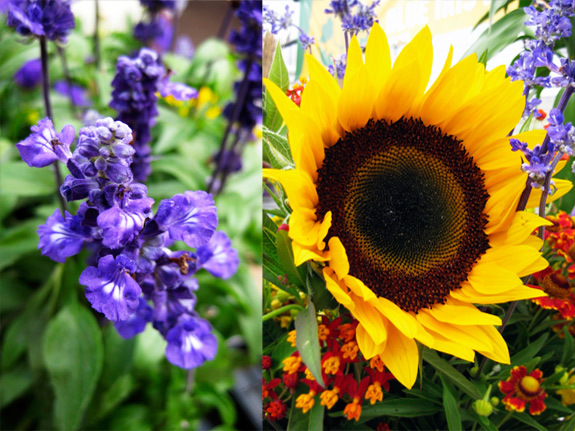 The flowers and galettes are just gorgeous and the perfect thing for the end of summer. It will take years for that peach pit (if its even useable, don’t know if its a modified hybrid or not) to grow big enough to begin bearing fruit. 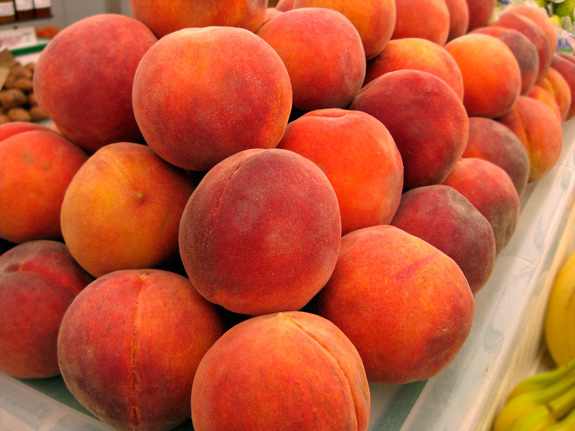 The average peach tree takes about 2-3 years depending on location to start producing fruit, or at least enough to use. yumm! who doesn’t love fresh peaches? 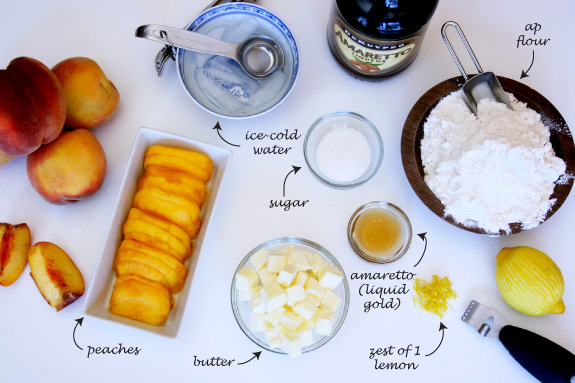 And who doesn’t love recipe that use fresh peaches?! great job, those look wonderful!!! 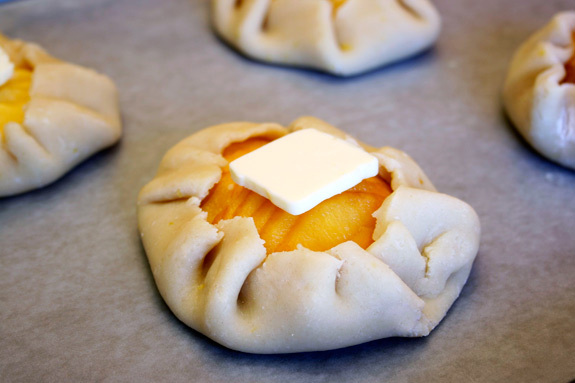 Yummy peach galettes! Love how they are mini sized. Hey, where does the amaretto factor in? Is that what you refer to as “liquid” in the recipe directions? Sorry if I missed it. Thanks! Why didn’t I think of that!!?? I’ve been wanting to make a galette but didn’t want a big thing to have to eat (have to ;). making them Mini is perfect!!!!! those pictures! and those little peachy heavens! well done. Decadent galettes! One of my favorite desserts. Amaretto is a lovely touch. I like your ‘mise-en-place’ pictures. I never had peach galettes but love apple galettes. Thanks for the great challenge this month. I had a good time making eclairs for the first time! As far as growing peach trees from pits, my uncle has this gigantic peach tree growing in his crowded little city backyard, and every year he digs up the seedlings that have grown up from the fallen pits and gives them away– I took a few, and in about four or five years, I had peaches growing! Apparently you do have to worry about if the peach is a hybrid though, because then I think a plant will grow from the seed, but the plant won’t produce fruit, or at least not the fruit you’re expecting! good luck! Beautiful galettes. The close-up photos are lovely, I just wish I could get a free sample :D. Lovely dessert. Those look amazing! Any thoughts how the best way to store them, and how long they will keep? Thanks Fiona! If you keep them in an airtight container inside the refrigerator they should last 2-3 days? They might last longer, but they’ve never made it past the 2nd day at my house 🙂 I hope this helps!